Used to configure many per-test settings, such as those in the Test Settings or Business Component Settings dialog box. You can click the Generate Script button in the General pane of the Test Settings dialog box to automatically generate an automation script containing the current test settings options, including those represented by the Recovery, Resources, Run, and Web objects. The Generate Script button does not generate information corresponding to the Launchers object. 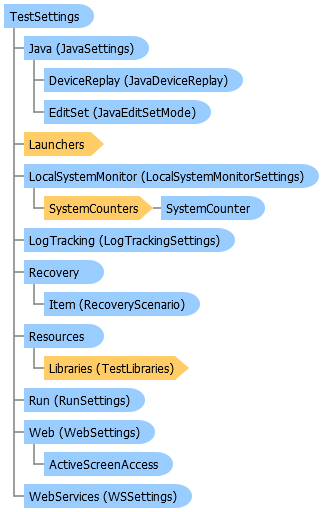 Java Returns the JavaSettings object, which enables you to set Java-related settings for the test or component. Launchers Returns the Launchers collection object--a collection of Launcher objects, which enable you to specify applications to open when a record or run session begins. LocalSystemMonitor Returns the LocalSystemMonitorSettings object, which enables you to define the system counters to be used for the test or component. LogTracking Returns the LogTrackingSettings object, which enables you to define log settings for the test or component (via its application area). Recovery Returns the Recovery object, which enables you to create and manage recovery scenarios. Resources Returns the Resources object, which enables you to specify the resources associated with the test or component. Run Returns the RunSettings object, which enables you to set test run settings for the test. Web Returns the WebSettings object, which enables you to set Web-related settings for the test or component. WebServices Returns the WSSettings object, which enables you to set Web service related settings for the current test or component.